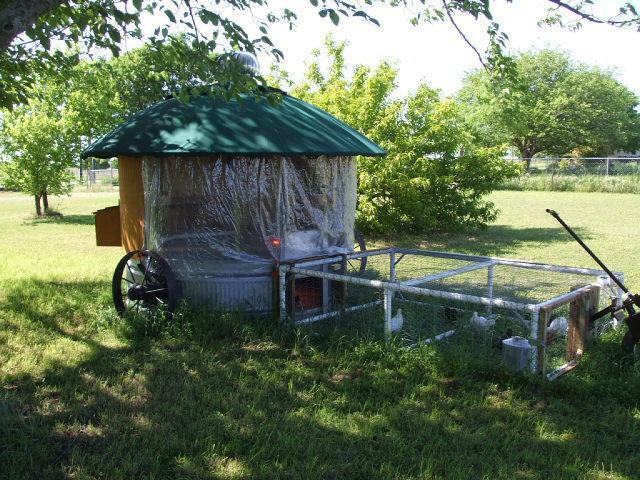 Take an old stock tank, 3 aluminum satellite dishes, couple of iron wagon wheels, rear wheel from a riding mower, 2 never flat bicycle wheels, couple of cattle panels, 2 x 4's, welded wire, chicken wire, T-111 siding, styrofoam insulation, discarded commercial gym set (pvc with metal pipe inserts), etc. etc. After losing 3 different flocks over the past 2 years to raccoons and coyotes on the very nights that I didn't lock the chickens up I knew something different was needed. Also figured into this decision was the fact that by mid-summer the entire garden pen area (about 2000 sq. ft.) was cleaned of any vegetation that was eatable. 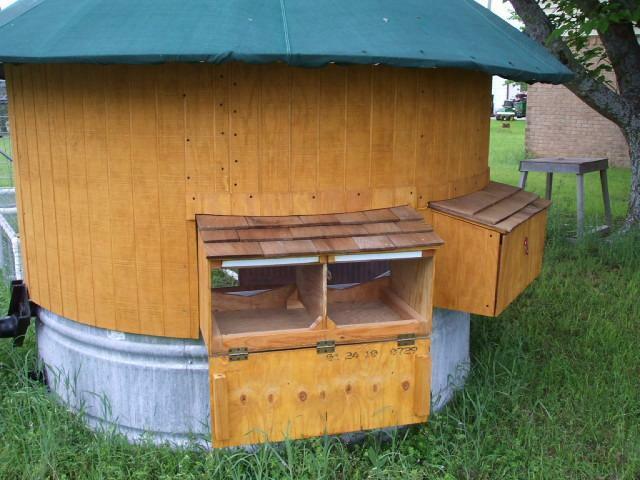 A mobile enclosed coop and run seemed to be the answer. 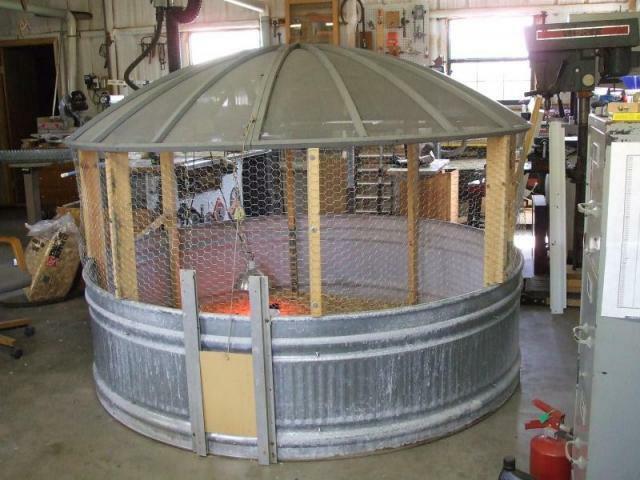 I used the stock tank in this configuration (first picture) last year for baby chicks so decided to re-build this. Removed and replaced the wall studs with longer studs allowing me to stand up inside the coop. The satellite dish was re-installed and styrofoam insulation was fitted between each of the aluminum ribs. The center of the dish was enlarged for the turbine mounting which would come later. Siding was installed and two double egg nests were constructed. The second satellite dish was installed over the original which securely holds the styrofoam in place and also provides some overhang to further protect everything. 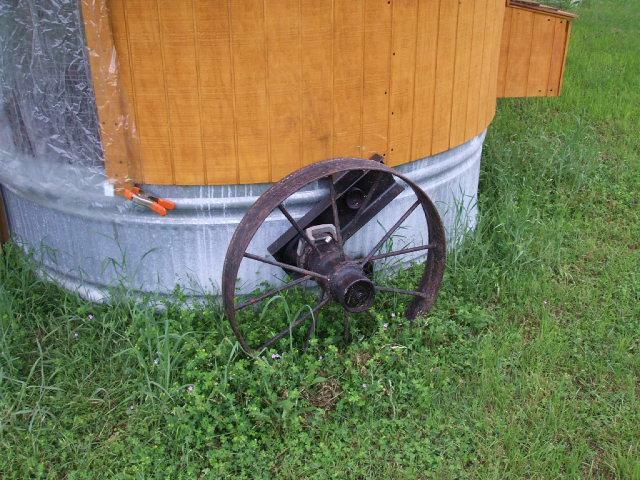 To facilitate moving this monster around I placed the iron wagon wheels on each side of the coop. These were built with a pivot mount so that with the aid of a short piece of pipe I could pivot each wheel down for about 3 inches of ground clearance. I also felt that their weight would be helpful in the Texas winds. The 5' X 7' run was built out of the gym set and covered with welded wire then 1" chicken wire. This run was securely bolted to the tank and a pivotable, steerable mower wheel was installed on the front of the run and has proven to be a solid unit and easily moved with a riding mower. To allow a little more raoming room for the ladies I took the third satellite dish and circled it with 2 cattle panels and a small garden galvanized gate. 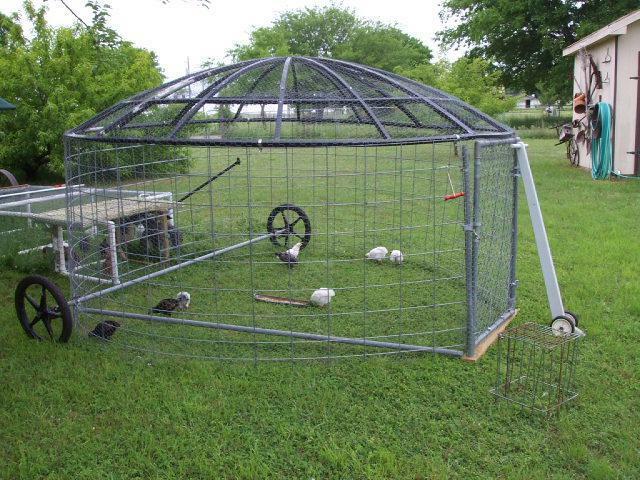 Top and sides were covered with 1" chicken wire with the goal of keeping the wild birds and other varmints out. 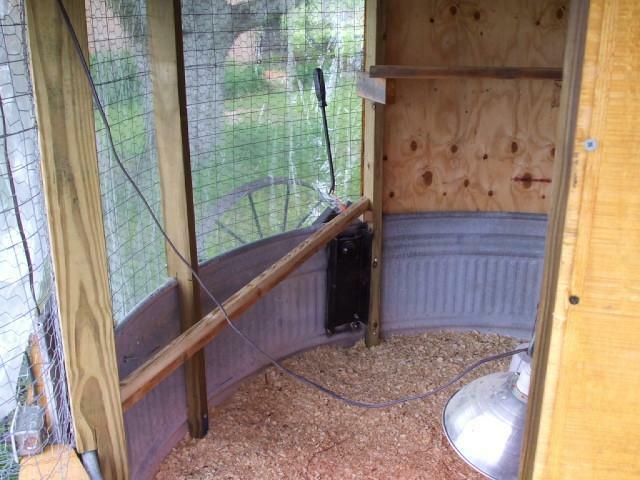 A small chicken opening was cut in the very back and that can be backed up to the chicken tractor which has a small hinged gate on the right side next to the front wheel. Shows a interior view and is a view of one of the nest boxes open. I've found the best way to move the chicken tractor is to close the chickens in the tank (sliding door between the tank and pen). This way I don't have to worry about a chicken leg getting caught in the wire while moving. When it's time to move I just make sure to close the gate after the ladies have retired for the night. The pictures are all over the place and I have no idea how to move them around. Suggestions anyone? agedog1, Skipper81, MotherOfPeepPeeps and 21 others like this. Very original, I've never seen one quite like it! This is great, I love that it’s been a work in progress and you adjusted and improved it. Great job! What an impressive and stylish coop! Great job! Wow ... I think this is brilliant! The use of the satellite dishes is BRILLIANT!!! Some of you people are just so talented it makes me look bad. Very nice you do good work. I have had a big domestic dog tear through chicken wire most most likly would not do that. . we have little weasels here oddly enough i never had problems with them though. I would use hardware cloth instead of chicken wire. Weasels can get thru chicken wire easily and other animals can rip thru or stick their paws in. Otherwise it’s a great coop!! Skipper81 and HennyPenny2019 like this. I like the use of the stock tank and the satellite dishes. Gotta love all the things going on in this system. Repurposing is taken to a new level! Skipper81, HennyPenny2019, Dawnclucks22 and 1 other person like this. BRILLIANT!! Creative and super cute! Now, that is recycling at its finest. Kudos! What a bunch of happy hens you must have. Skipper81 and Chelle'sChics like this. very very ingenius!!! that would very easy to clean too I bet... wish I had one. What a fantastic set-up you have! I especially like the security of using the stock tank. The pivot mount wheel thingy stumps me. I guess I'd have to hire a welder for that. Thanks for sharing!